Serve up some modern style with reclaimed wood and jute rope on the side. 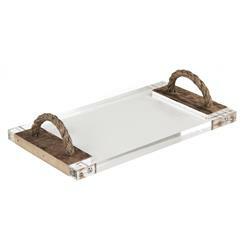 Sleek, sturdy acrylic provides the generously-sized base for this serving tray. Reclaimed wood frames the sides of the tray and anchors the rustic rope handles. Offer your guests appetizers, desserts or anything in between on this tempting tray.